Artisan: A skilled craft worker who makes or creates things by hand that may be functional or strictly decorative. Join us as we celebrate the transformation of Detroit Fiber Works into a Maker Space, featuring local artists who make beautiful things. Come back to our site for artist profiles, product images, special event announcements and more. We will be joined by local artists who make beautiful things! 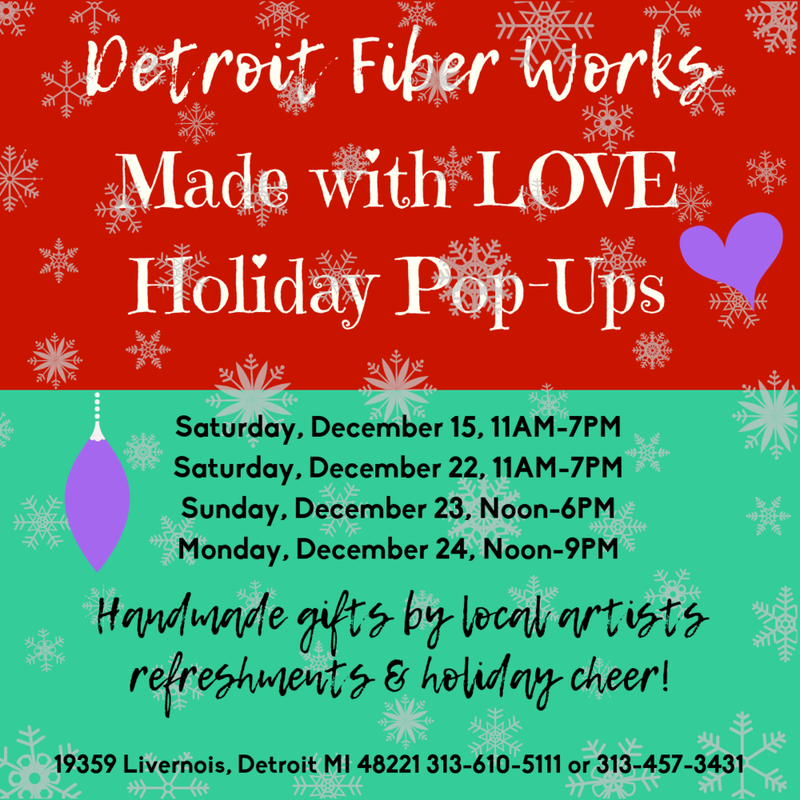 Plus, we have lots of goodies to offer at Detroit Fiber Works: art for your walls, handmade jewelry, luscious body butter, intoxicating candles, artful handbags, felted bowls, baby things, delicious granola, and more, more, more! Stop by and have a sip of warm cider! Artist Talk: The Work of Levi Johnson, Jr.
Levy will share insights into his life, techniques and inspiration as an artist. Please join us! Levi Johnson is a a multi-faceted person, a multi-talented artist, and a true Renaissance man. He creates in many mediums, including pastels, found art sculpture, painting, and most recently, Fibonacci pins which are made from pinecones, embellished with Swarovski crystals and other findings, and painted by hand in a dizzying array of colors. His Fibonacci pins have been featured in the Detroit News. Levi is lead singer in two bands: The Saints of Soul, and his own band, The Pearl Handled Necktie. He is a self-taught kalimba player and a trained gospel singer. “All people should have an appreciation for art. Art gives depth to our lives, whether we practice it or simply observe it. Art makes you a better, fuller person, a richer person. If you have a privileged life, art can complement that. If you are not in a position of privilege, art can supply you with hope and certain comforts. I believe that art is vital to our well-being. It centers, soothes, and gives peace and joy. Coming Back to Detroit Fiber Works! Jimi King is making his annual winter stop in Detroit and we are both honored and excited! A native Nigerian who now lives in Atlanta, Georgia, King is a third generation textile designer. He also studied fashion and textile design in London. He spends a lot of his time traveling the world in search of unique fabrics that he can incorporate into his designs. His artistic techniques range from batik to tie dyeing to hand printing and silk screening. He also uses a variety of fabrics such as Dupioni silk, cotton, spandex and traditional African fabrics. Most recently, he opened a new store in Washington, D.C. When you buy clothing from Jimi King you know you are getting a handcrafted one of a kind work of wearable art. Join us for high fashion, mimosas, music and fun! 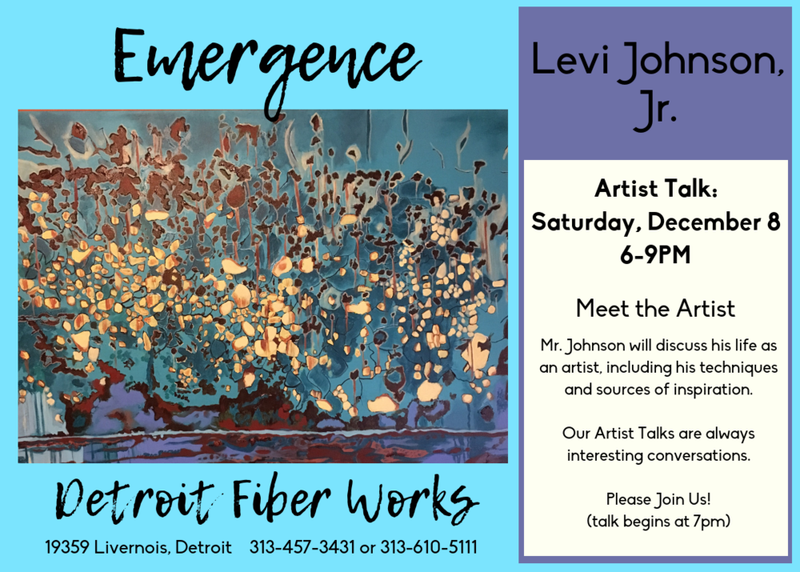 Emergence: The Work of Levi Johnson, Jr.
Detroiter Sadiq Bey, rekindles his former self in an old occupation, artwear maker, after coming home from a 12 year stint in Europe (Italy, Germany) as writer/performer, teacher. He enjoyed a lucrative metalsmithing enterprise during the 70’s and 80’s, with clients across the country. Although better known for poetry and music, Sadiq is remembering a way to create beauty you can touch through “ornamentation” rather than jewelry making. He suggests that the poem is not always in words, but rather, materializes as adornment as well. More akin to expression, as in poetry, than a fashion statement, is what he hopes comes to the viewer. A year of dedicated creativity in the studio has produced hundreds of earrings, bracelets and neck pieces with the Neo-baroque motif to architectural influences. This exhibit features four Detroit women, each exploring new dimensions in their art. Our Second Saturday Artist Talks are always thought-provoking, revealing, stimulating and fun! Cydney Camp (b. 1994, Detroit, MI) is a self-taught visual artist, creative entrepreneur, and economic development professional. She is the founder and creative director of a live art experience called The Process: a popup event in Detroit that unites art, culture, and nightlife, to highlight the magic found within the creative process. As a visual artist, Cydney works with oils, inks, and watercolors in a figurative abstract style. Her work celebrates the unique diversity of the black American experience through colorful figures that express themes of truth, community, femininity, and identity. Jenai Jackson is a twenty-six year old native Detroiter, visual artist/creative, painter, model, poet and writer. She is the author of two books called “Jenai’s Pure Naked Truth” and “Jenai’s Soul fire: The Lit Flames Unleashed”. She specializes in several mediums: acrylic, oil and mix media. As a creative artist, her goal is to increase and influence positive cultural impact and community standards of the African diaspora and an evolving sisterhood and unity within the race. The meditative, yet mosaic feel her art offers, is a combination of details and mix media enhancement to offer the eyes a deeper experience. Jenai defines her mosaic- feel works through a quote she wrote: “You tried to break me, but even the broken pieces of me are masterpieces”. Jenai’s creative works offer strong commentary on black culture, self-discovery and realization, strength, afrocentrism, womanhood, diversity & hardships and unity in the African American community. As a writer and artist, she aims to convey deep messages of her life lessons, experiences and poems through her paintings. Since age 8, she has been writing poetry, and she found art at age 23, when she received visions in her dreams and in reality and decided to pick up a paintbrush. Her works have been exhibited at The Carr Center, The Baltimore Gallery, The Riopelle Gallery, CCS Taubman Gallery and the New Wave Gallery. Locally, she exhibited at Clubhouse Detroit and The Centre Bar. Her poetry is currently exhibited at Civil Rights Heritage Center in South Bend, Indiana and The Saginaw Museum. Her mural resides in the home/office of the nonprofit organization, Enjoy Detroit. She is currently working on her third poetry book and preparing for her second solo art exhibition/ book signing. LM COZ is a born and raised Detroit artist. She graduated from Detroit Community High School and studied science at Wayne County Community College District. Her career started when she exhibited her artwork at Dabls African Bead Museum in 2013. Since then, she has shown art in Michigan, Miami, Amsterdam and China. She also has a YouTube show called "Let's Create Art with LM Coz". L.M. 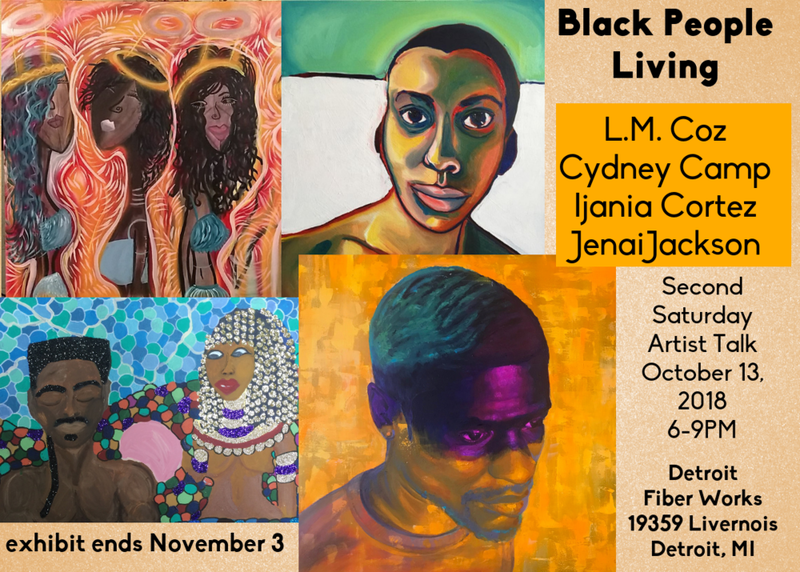 Coz has shown her artwork at The Fel'le Gallery, Sherwood Forest Art Gallery, Jo's Gallery, Micah's Salon, the Lucky Duck and many other locations throughout Detroit. During her spare time, she conducts art parties, art shows, exhibitions, festivals, children's programs and much more. Ijania Cortez was born July 31, 1990 in Detroit Michigan. At an early age she was encouraged to pursue art from her teachers, and began to study on her own. Though she lost touch with her craft in her high school years, with encouragement from peers, she began to create art again in 2012. Rediscovering her passion, she began teaching herself through strenuous study. She hosted her first solo exhibition, A Summer Nativity, in July 2017. Focusing on portraiture, the artist’s work uses vibrant colors and scale to evoke a sense of divinity in her subjects. Handcrafting customized canvases from salvaged wood and building material, her pieces have been described as soulful, provocative, and indicative of the beauty of the human spirit. The goal of my works is celebratory, I love depicting people of color in full color, in a context that is purely millennial. My hope is that people not only see beauty in my work, but that that beauty is interpreted as a reflection of themselves. "Exploring color, line, texture and composition, especially in how it relates to nature, has been a joyous focus since childhood." Marjorie Brown earned a B.F.A. (emphasis on drawing and printmaking) from Michigan State University along with a teaching certificate in art education. She has also completed coursework in drawing and fiber at the College of Creative Studies, painting at Mass College of Art and she has participated in numerous art workshops and seminars. Her artwork has been shown and sold at various venues in Michigan, Massachusetts and Rhode Island. One of her large fiber works was exhibited and sold at the ArtPrize competition in Grand Rapids, MI. This is Marjorie's first gallery show in many years, and includes watercolor, felting, stitching, printmaking, and drawing. Karen F. Sanders is a documentary photographer, educator and lens-based digital media artist working in the realm of cultural landscapes and the relevance of race, ethnicity and gender in visual protocols of representation mediated by photography-based digital geographies. The primary interests of Karen's work is with photography as it is experienced in its broadest and most common sense and how photography functions empirically as object and knowledge. The pursuit of her creative work along these lines has prompted investigations of the persistence of difference in the embodiment of normative conventions of seeing and visual representations in digital thresholds of public space. Karen's current work is situated from a position centered in the self-narrated socio-cultural identity unique to Detroit and woven beyond some of the erroneous, line drawn notions of the city, digitally interfaced and globally networked. "I am endlessly fascinated by the art of felting, and delighted by the transformation of wool fibers into abstract art." Mandisa Smith is a lifelong Detroiter whose work is constantly evolving. She explores color, form, and texture as a means of expression, finding inspiration in nature, African art forms, and past and current events. Questions, answers, and more questions. Najma Ma’at Wilson has been a fiber artist for over 30 years. Initially her interest in traditional African textiles impelled her to study fiber design at the College for Creative Studies (CCS). There she studied weaving, dye techniques, silk screen and jewelry and earned a Bachelor’s Degree in Fine Arts. Upon graduation, Najma established her own design business, Hand and Spirit, creating fabrics for body adornment and interiors. She also has a Master’s Degree in Education from Cambridge College in Cambridge, Massachusetts. Many corporations feature her wall hangings: Blue Cross Blue Shield of Michigan, Sinai Hospital, Crittenden Hospital, Henry Ford Hospital, Compuware of New Jersey as well as private galleries. Her fiber work has been exhibited in Boston, Chicago, Detroit and Washington D.C.